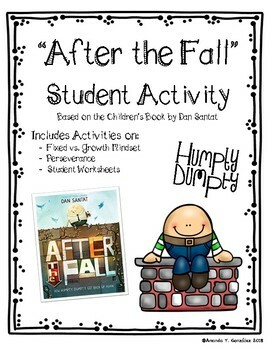 This product was designed to be used as extension activities for the children's book "After the Fall" by Dan Santat. 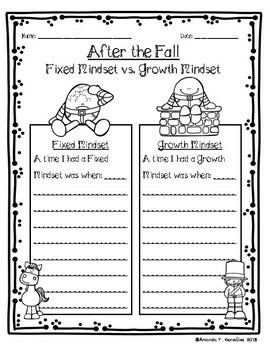 Included are 4 student worksheets related to Growth and Fixed Mindset, as well as a student project/craft. 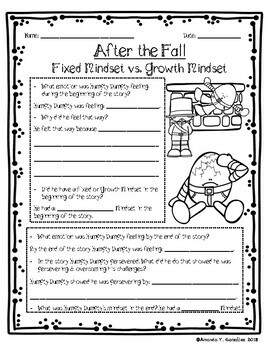 In addition this activity includes 3 definition pages discussing: Fixed Mindset, Growth Mindset, and Perseverance. Also provided is a page with "Teacher Tips" for ideas or suggestions related to the activities. 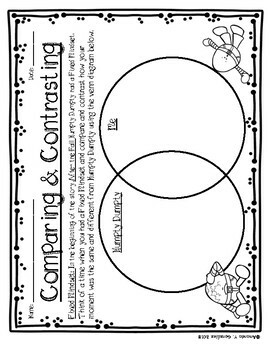 This activity incorporates: writing, comparing and contrasting (using a Venn Diagram), Reflecting on past experiences, social emotional language, discussing feelings or emotions through conversation, etc.